We walked down to Atwoodfest this afternoon and again Terry joined us for the fun. I watched most of Chicago Blues Hall Of Fame guitarist and Madison resident Paul Filipowicz's set before making a couple treks up and down the street. This will be mostly a pictorial post as I'm a actually quite tired. I was hoping to have a fire again tonight but I think I will end up in bed early - especially early for me on a Saturday night. 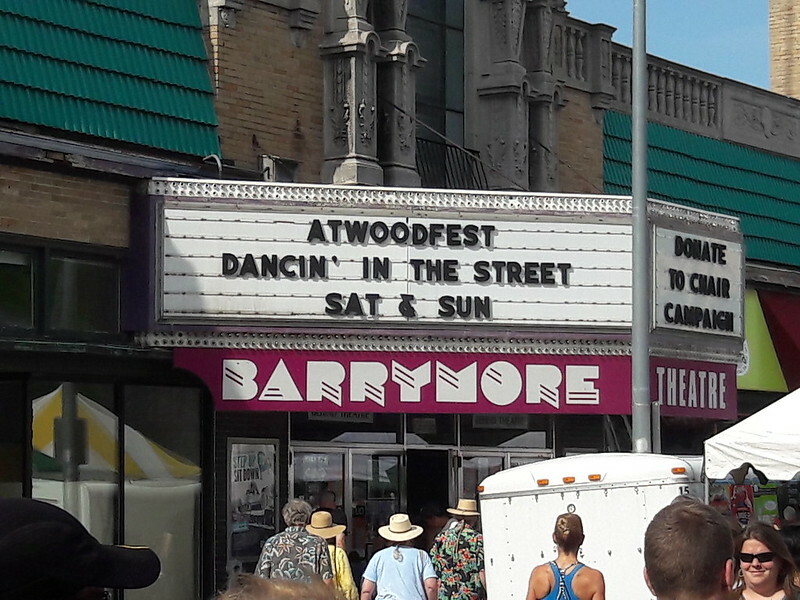 Tomorrow there are things to do in the morning, then a different friend and I will be headed down to Atwoodfest again for more revelry in the beautiful weather. Lots of people, music, beer, food and vendors. Should be a grand time again! 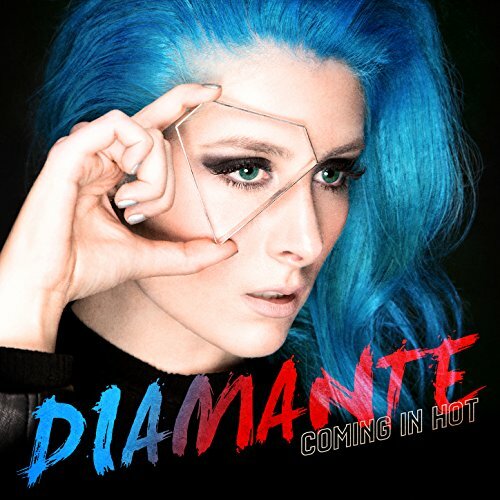 Diamante is a performer that just over a month ago I saw the album cover and song titles with a two word description - Alt Metal, but I was intrigued so I looked her up on Youtube and I've been playing her CD constantly ever since. This is how I find out about a lot of new music, and I still haven't seen any reference to her on any of the music sites I visit daily. Well, here's your notice, because I think you may be hearing more about her soon. I hope so, anyway, because I really enjoy her voice and music. Coming In Hot is her debut album, just out last month, June 15, but she has put out a few EPs of earlier material and then songs off the album leading up to the release. She is a self proclaimed 80's metal fan despite her very young age so that may explain why I find the music appealing, but judge for yourself. There is a series of short videos of her giving some background, the first of which is here. She is the daughter of an Italian father and Mexican mother, born in Boston, Mass. That's interesting right there. Below is her video for the upbeat and fun title track, but she also has videos for the songs Haunted, Had Enough, and the ballad I'm Sorry as well as several lyric videos and even a collaboration with current tourmates Bad Wolves. That's a lot of videos for an artist's debut album, She is obviously well-backed by someone who believes in her, or she's already six figures in debt at age 21. And if you know me and my OCD then you know I love the live stuff. When I found her website I saw that she played here in Madison a few weeks before the album came out and before I knew anything about her. Bummer. I did find one video of her full half hour set from a few weeks ago, and I've enjoyed it a few times. Remember the name, I think she may get bigger soon. Now play the show! I've never really discussed my job here on purpose, but I have mentioned over the last year or more how unhappy I was and that I was searching for another position. Well, I finally found that other position - and with my current employer instead of starting over someplace else. Last Monday I accepted a job that I used to have several years ago but was forced to leave the department back then due to the company losing a contract. Technically, it is a lower position, and even though I was prepared to take a pay cut I will continue at my current rate, which is very nice. I begin my new job a week from tomorrow, and I can hardly wait. It feels like a weight is being lifted from me. I'll be working with most of the same group that I did back then, and that may be the best part as they are lovely people. Making it through this last week in my current position will be the tough part. Hopefully, less stress and worry will improve all facets of my life and I'll just be an overall happier person. That's the goal, anyway. I would love to elaborate, but this is not a place for me to discuss work. I want my life outside of work to be free of thinking about work, and that includes sharing too much about it here. If you haven't heard, there is a campaign in the United Kingdom to make the song American Idiot, by the band Green Day, number one on the UK charts to coincide with President Trump's visit. I'm laughing already but I'll love it if it actually hits number one! 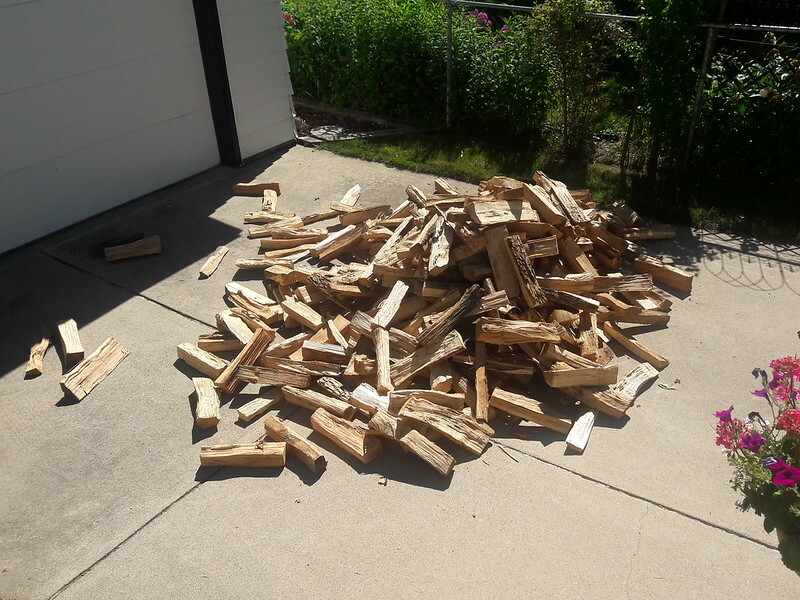 As of today I have enough firewood to last us for quite some time. I've said earlier that the wood I scavenged won't be near enough with this new fire pit, so I looked online to buy some firewood in bulk rather than piecemeal and save some time, money and worry. I'll still scavenge the downed limbs I see on the curbs when convenient but having enough on hand is comforting. First of all, I planned ahead and ordered a rack for the firewood that arrived last week, assembled it last weekend (it can be glimpsed empty over at the last garden blog entry), and have it placed along the fence line near the fire pit, both for convenience and it was only one of two places seriously considered for the rack. I found several places in my search for firewood, most similarly priced, but settled on this one. I contacted them and ordered a face cord, 4' x 8' x 16" of stacked and split wood, 1/3 of a full cord. It cost 159 dollars for kiln-dried mixed hardwoods, and it was delivered today while I was at work. It took my wife and I the better part of an hour, but we got it all stacked, stored, and swept up. The rack is 4' x 8' but the bottom is off the ground quite a bit so it wouldn't hold all the wood. You can see some placed to the left that will be used up first, and also about the same amount as that in the garage with the other fire wood. I also bought a 17" splitting axe to make bigger pieces smaller. Yes, for firewood I'm all in at about 280 bucks for the wood, rack and axe. The fire pit is about 170 bucks all in with accessories. Um, maybe I shouldn't think of the money. 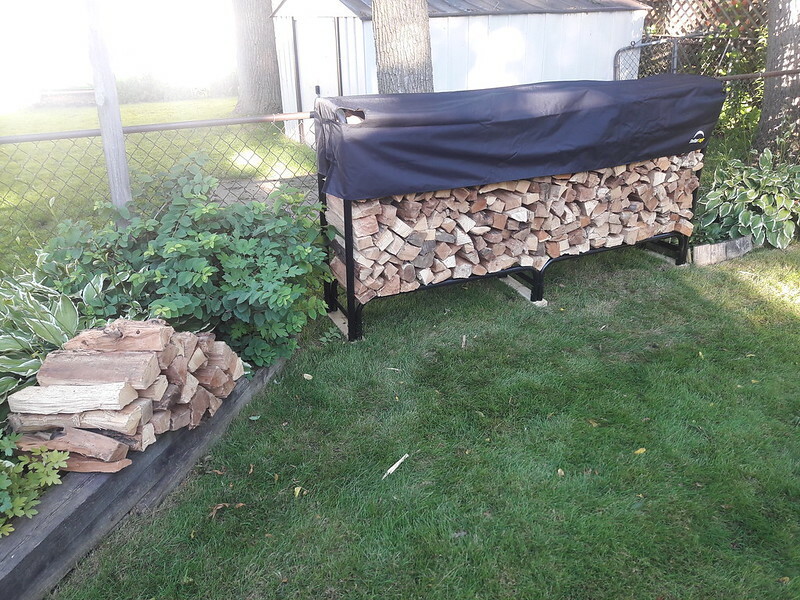 But it was very worth it for me, with my wife's support, to not worry about how much I'm burning or having to pick up smaller, more expensive bundles of wood for the rest of the year. From what I scavenged last year I have enough for probably 2 conservative fires, now it's a worry I don't have and won't for some time. 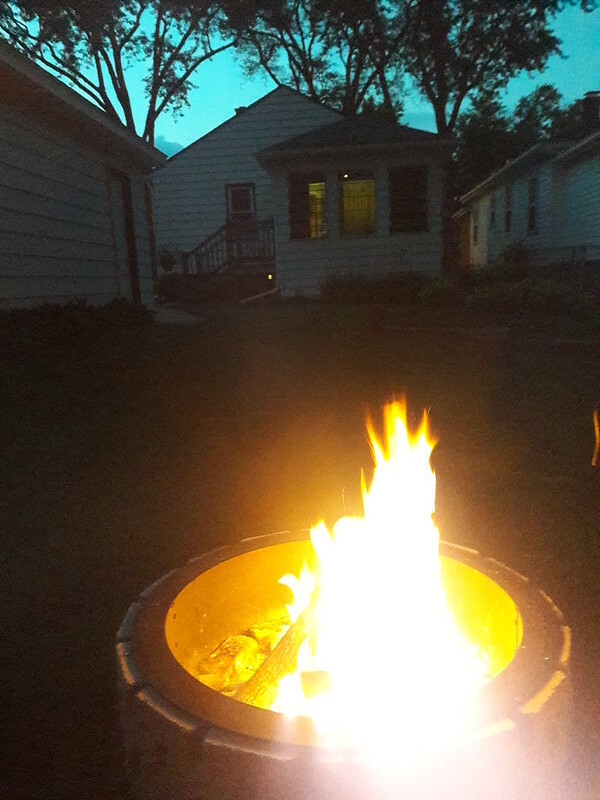 Plus, just the enjoyment and how much more often and easily we can relax around a back yard fire pit is priceless. Come on over. Sit by the fire. Let's talk awhile. It usually ends up pretty okay! 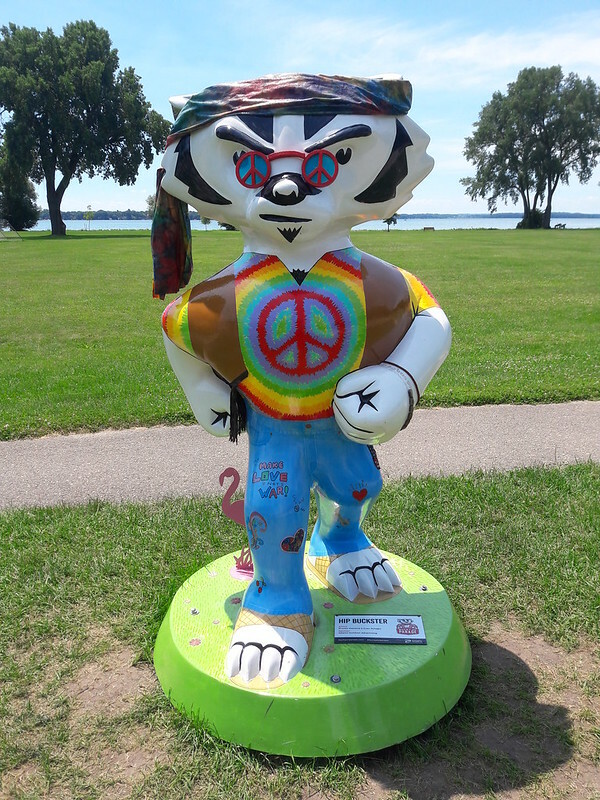 As I ran errands the other day I saw the Bucky at Olbrich Park right by the road so I pulled off and took a few pictures. This one is called Hip Buckster. I almost didn't stop as the novelty has worn off for me. See, I'd been using this picture of the Bucky "Grow" as a background on my computer at work recently. A co-worker noticed and we briefly talked about it before this wanna-be goody-two-shoes pig we work with started gushing about collecting the Buckys. This pig has complained about me and others several times at work, sometimes getting me into trouble, but is always so nice to me when she needs help or has a question. I am disgusted with (and by) her and want nothing to do with her anymore and she pretty much knows it. Since that original conversation she seems to have to bring it up to the group any time her family gets another one. She disgusts me enough that it has seemed to ruin this for me, so I don't think I'll be going out of my way for any more. I now have the four that are in my area, that's good enough for me.